In 15 days “The Man” burns at Burning Man in Black Rock City, NV. For those who wonder what this has to do with California, the largest contingency of participants come from our state. Two of the festival events — Decompression, and Artumnal Gathering — take place in San Francisco this Fall. A hot wind blows at Rancho Mission Viejo Rodeo, George Porter Roping and Truckee Championship Prorodeo this weekend. See rodeos! At Chico Summerfest on Aug. 22 guests can escape the heat at a Cooling Tent brought to you by Bob’s Air Repair. 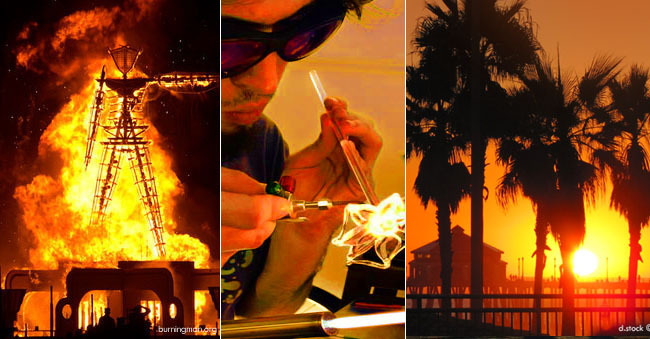 Sand City’s West End Festival glass artists rely on fire to ply their trade in front of passers-by Aug. 21-23. Musicians fry their amps with gusto at music festivals such as Modesto’s X Festival on Aug. 22. It’s smokin’ hot this weekend at Napa’s Blues, Brews & BBQs on Aug. 22. 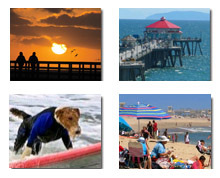 Blazing sunsets — linger at the beach on Aug. 22 & 23 for Hueneme Beach Festival and Long Beach Tiki Festival.